Portable LCD Screen For The Xbox 360 | OhGizmo! As inelegant as the Compact TFT Monitor EX looks, it’s probably as pretty a portable Xbox 360 system is ever going to get. Developed by Hori (makers of the Onimusha sword controller and the Final Fantasy X-2 gun controller), the monitor is simply a 12.1 inch LCD monitor that straps to your Xbox, and lets you play wherever you’re able to find two electric outlets. Yeah, that’s one outlet for the console, and one for the screen itself, but it is able to output in 720p and gets its signal from the 360 via analogue RGB. It’s not all that expensive, at 36,750 yen â€” or about $302 and it probably weighs a hefty bit, but if you’re keen on playing a few games in the boarding area of a random airport, lugging all this stuff around is just about your only bet for now. Considering how many 360's had a red ring of death due to overheating, the placement of the monitor directly on it is somewhat precarious. 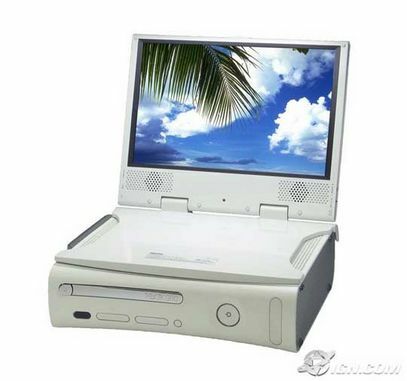 If you are going to put a screen on the xbox 360, I would go for the Xbox 360 laptop. I think it has a 21' screen and the creator has made sure that it is well ventilated. does the screen's speakers have enough juice to overpower the fan & drive noise when you're sitting that close to your “portable” 360?